'Just got back from Big Sur. There is something special about driving at night in fall. Something about the brisk, dense, roaring cold air bringing out the scent of the woods, the falling leaves, the pounding surf, with its salt spray... It is best described as winter with color minus the wet, rainy roads. How did a line from The Art of Noise go? 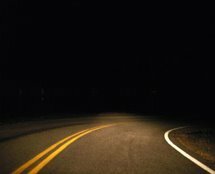 For a couple of hours, there I was, top off, windows down, hurtling through the darkness at up to a hundred miles per hour, the trajectory of my will only dimly imposed by a pair of anemic headlights. Inside, the radio off, all that accompanied me were the thoughts in my head, the heater on full blast, and the roar of the darkness outside. For a while, I became the unacknowledged third, accompanying Clov and Hamm, going about the routine, watching the hours pass, steadily wilting under its assaults, proving the terrible inscription, Vulnerant omnes, ultima necat, truth. CLOV: Grain upon grain, one by one, and one day, suddenly, there's a heap, a little heap, the impossible heap. Cacooned in my car, warmth, thoughts, possibilities, and yes, dreams; outside, the nameless roar of darkness, chance, and yes, perhaps tragedy. HAMM: Outside of here it's death! Peering through the glass darkly, I hurtled on through the night.